Seattle coffee fiends — in fact, coffee fiends around the world — are already well aware of the gaping hole left in local — global — coffee culture when the original Vivace roasterie location was finally torn down. Sound Transit is putting in a light rail station where Vivace once stood. The train hasn't been built yet, but they've cleared out the lot, tearing down several local businesses. Vivace had some lead time, and an innovative leader in David Schomer, and they've already opened a new store on the other end of the block, in addition to the one down by the REI. But for a Seattle native, there's nothing quite like the Vivace Sidewalk Bar on Broadway. An hour ago I stopped by in the middle of running errands all over town. It's a grey, misty, miserable, cold, dark day in Seattle (a "mizzy" one, as my sister puts it). The kind that drives non-natives crazy, but which I happen to relish. Still the cold and rain and darkness can get you down. Which is why we have ta-daaaaa! the best sidewalk espresso in North America. True professional baristas making you true espresso beverages. It's tucked into a little stand just between a couple of retail spots. Just a warm, red little space without even a door. Just step in under the awning from the rain, order your drink, and two world-class baristas make your cappucccino with speed and aplomb. I had a cappuccino today, and a conversation with barista, Teal, an old friend of mine. It really made my day. Now that the sun is setting at 4:23 pm, I'm back in my house doing a little work on the Ethiopia project, and this cappuccino's making everything all right in my universe. So there you have it, Vivace's classic cappuccino, this week's Coffee of the Week. The last week I was in Ethiopia I spent a few days visiting the mills of farmer cooperatives in Sidama and Yirgacheffe. Most of my time was taken up with lengthy meetings with the cooprative committee members and union representatives, explaining to them our program, asking their blessing and participation, and listening to their comments and questions. But we also found time to visit the milling stations of these co-ops, where coffee cherries are brought to be pulped, washed and dried. I probably visited about 10 such mills in four days. One of the most memorable stops was at the Wottolna Butulma cooperative mill in Aleta Wondo. When we arrived at the mill, the workers were taking their mid-morning break. Coffee is prepared for the workers in the traditional style. A woman (always a woman) roasts the coffee over coals, then the coffee is ground using a mortar and pestle, and boiled in a traditional urn. When it's ready, the woman pours it out into small cups which are passed around to all the workers. I had heard before of the salted coffee sometimes drunk in Ethiopia, but I in all my travels here, I had never tasted it. When we sat down to join the workers for their coffee break, I was warned that it would be salty. In fact, I was offered a cup without salt, sensitive as they were to my faranji tastes. To which I said, "Hell no! I want the salty stuff." Well, it was SALTY. The cup is like an espresso cup, and they put a whole teaspoon of salt in there. It was actually kinda good, though it made me very thirsty. My Ethiopian agriculturalist friend later told me he was impressed with the quality of the coffee they had served. All I could think was, "How on earth could you evaluate the coffee? All I could taste was the salt." But that's the nature of trying new things. Other people are more accustomed to certain things, and they can "taste past" something that stops me dead. It's like when I have to teach people to really taste and evaluate espresso for the first time. Anyway, it was a memorable morning, and like I said, the coffee was actually pretty tasty. So I'm making it my Coffee of the Week. For the last day of our cupping class last week, we spent the day focusing on coffees from Harar itself. On the final cupping table were three clean, specialty-grade coffees from this region. If you drink Harar coffees in the United States, you might get the impression that it's one monolithic region. Certainly the coffees are almost always simply billed as "Ethiopian" or "Ethiopian Harrar." I can't recall ever seeing a bag of roasted coffee that offered more information than that. Of course, this is usually not the roaster's fault. It can be difficult to get more specific information about geographical origins here. Nevertheless, there is a noticeable difference between East Harar and West Harar, one that the coffee professionals here have no trouble distinguishing. 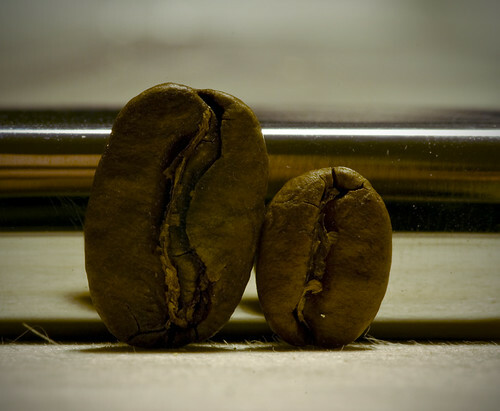 Also included under the umbrella of "Harar" coffees are coffees from the regions of Bale and Arsi. If you look at a map of Ethiopia, you can see just how far these regions are from the central areas surrounding Harar city and Dire Dawa. These coffees get exporter as "Harar," but the locals often consider them to be separate origins. Of the three coffees on that final table, one was from East Harar, one from West Harar, and one from Arsi. Most of the cuppers, myself included, gave all these coffees a score of 80 or above, qualifying them as "specialty grade." I very much enjoyed the West Harar coffee, and found the Arsi coffee to be perfectly fine. But it was the East Harar coffee that truly stood out. This is the magical flavor profile that buyers in the States are so desirous of, and so frustrated about when they cannot find it. Think blueberries, cherries, chocolate. The mouthfeel is rich and creamy, and the flavors relatively heavy, but the acidity still has a bright clarity that enlivens the whole cup. The aroma notes I wrote included toast, honey, caramel, and the aforementioned berries and chocolate. I'm a pretty harsh grader most of the time, but this coffee was to me a solid 89. Most of the class agreed. I had a conversation today with a friend here about not wanting to ignore the very good quality that comes out of West Harar and Arsi. There are some excellent specialty grade coffees to be had from this region, and they are at risk of being overshadowed by East Harar, which would be a shame. But I have to give credit where credit is due. The East Harar coffee is indeed special. My few sips from the cupping cup I had of it were the most memorable sips I have had in a week of excellent coffee here. So there you have it, the gem-like quality of East Harar coffee, this week's coffee of the week.